Been wanting a new gun because it was time to retire my S&W 39-2. Love the 39-2 but want my Boy's to have it one day and since it has held up all these years a New S&W just made since. awesome brand that lives up to their name. Grab A Gun has the best deals. Incredible price with the included options, reliability, comfort, and concealment capabilities. Good reputation of S&W M&P Shield 9mm for CCW weapon plus tritium sights makes it more effective in low light conditions. Great Price! Flat Rate Shipping! Will likely be my EDC piece. 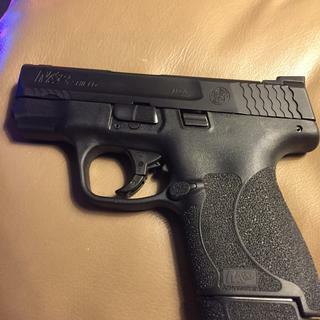 To be my EDC gun, S&W reputation...have M&P compact and love it. It was between this and the Glock 43. I ended up chossing this because of the better grip ergonomics and dank price. I chose this because I'm at a point in my life where spending money I don't have on toys that I shouldn't have makes sense. Jokes aside, the M&P line of pistols are ergonomically superb and exhibit great reliability. You can't beat that. Upgraded from first gen shield (no safety) to this. Well worth the upgrade! Great hand gun for cc. Its accurate and easy to shoot for its size. Grab A Gun had 2 day shipping. Very satisfied. Feels really solid in my hands, I may actually prefer the ergonomics more than my Glock. Very slim profile for concealed carry, yet doesn’t feel like a compact pistol in-hand. Gun came even faster than they estimated. Picked it up from my local gun shop no problem. Only annoyance: a week after I bought this, they dropped the price by almost 100 dollars. Made me a bit hesitant to jump on deals I see for the next time. Very happy with this model, have had great results at the range. Not one jam, mis-fire, stove pipe etc with various FMJ ammo. It has been my daily carry. This is a great gun. Small, but still large enough to manage proper grip and trigger control. I shot a couple hundred rounds through it and it ran flawlessly. I also added a TLR6 and it was even better. At lest till I took it on a hike and dropped it, and it went down a 200’ cliff, into a den of badgers. Hopefully I will be able to get it back tomorrow when I go back with some rope and something to keep the badgers from attacking me. This semi auto is a perfect concealed carry for me. It's right for my hand and very comfortable to shoot. I just wish it came with a case, instead of a box (minus the star). Shot flawlessly at the range, like I had been practicing with it for years. Very pleased with the performance. Great size with a full grip. This is a great size and capacity for carrying. I got this as a side arm for hunting rather than carrying the full size Glock 17. Would also make a good concealed carry. Great firearm! Extremely reliable. My EDC weapon. Arrived extremely fast. Couldn't be happier with this handgun and grabagun!!! Shoots nice tight groups. 200 rounds through it so far and no malfunctions. Carrys much easier than my Glock 19. Great service as usual from GrabaGun. Very nice concealment pistol when carrying my 1911 is impractical. MAGAZINE DESC:One 7 rd. & Two 8 rd.